The Nozovent nasal dilator opens the nostrils and allows more air into the nose, enabling snorers to breathe normally through their nose rather than through their mouth. Nozovent helps to reduce snoring by eliminating the tendency to breathe through the mouth. The Nozovent nasal dilator is a proven way of reducing or stopping snoring. One of the most common reasons for snoring is a congested nose. Nasal stuffiness can prevent snorers from successfully breathing through their nose and encourages mouth breathing. This causes the relaxed soft tissues of the throat and palate to vibrate, which results in a loud, harsh breathing sound that occurs during sleep, also known as snoring. 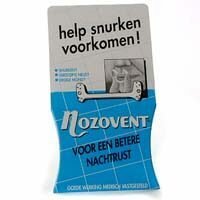 Nozovent helps to reduce snoring by opening the nostrils and preventing the inclination to breathe through the mouth. Place one Nozovent wing in each nostril with the long side pointing forward. The nasal dilator is made from hypoallergenic silicone which ensures that the device does not come into contact with the mucous membrane and cause damage or irritation. After use, clean the Nozovent nasal dilator thoroughly with soap and lukewarm water. The Nozovent nasal dilator can also be used during sports activities. After all, many people breathe through the mouth when exercising because the body wants more oxygen than normal nose breathing allows. Nozovent increases airflow by opening the nostrils, allowing more air to pass through the nose. As a result, the body is able to continue endurance activities for longer periods of time. Research has shown that Nozovent significantly reduces snoring. The test subjects suffered less from problems such as a dry mouth and throat. In addition, they woke up in the morning feeling more rested.